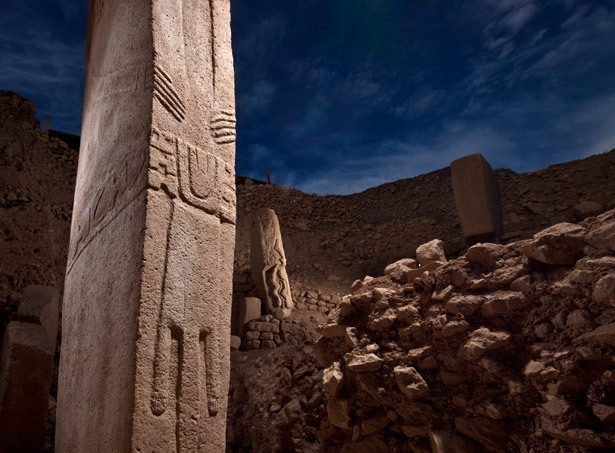 Last week, I read a post on an NPR blog discussing the unearthing of Göbekli Tepe in Turkey, and this immediately appealed to my growing interest in the evolution of religion. 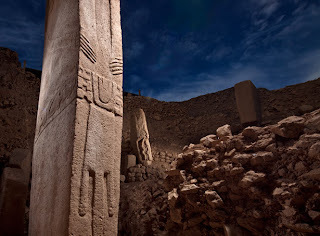 Klaus Schmidt, the archaeologist who has led this excavation for the last 17 years, is not alone in his speculation that this site may be the world's oldest temple, and therefore that a sense of the sacred in human consciousness and behavior gave rise to civilization. This is a significant shift from what many anthropologists have traditionally assumed, that environmental pressures gave rise to agriculture, which in turn gave rise to civilization as we know it. But, as an article in the June 2011 issue of National Geographic points out, there is still no consensus, and there is always the possibility that several different "paths to civilization" were taken alongside of agricultural and religious means. More recently, archaeologist Ted Banning has suggested that the structures at the dig site might be domestic space rather than sacred space, although he acknowledges the likelihood that some rituals did take place there. Like many of those who posted comments on NPR's coverage of this story, Banning takes issue with the assumption that the presence of decorative art in a building indicates its use for religious purposes. One of his reasons for objection is that, among ancient peoples, there was no sharp distinction between sacred and profane; in other words, we should not be so quick to impose our Western perception of a religious/secular dichotomy onto prehistoric cultures. This important find is sure to spark debate for years to come, but I just want to share two quick thoughts about the two positions I've summarized above. 1. First of all, terms like "dawn" or "origin" don't sit too well with me. To be fair, I'm sure that writers like Charles Mann (National Geographic) might very well be using the phrase, "The Dawn of Religion," loosely. But I think that it would be more helpful for the layman's understanding of cultural evolution if we stuck with terms like "emergence," or "significant advancement in the continuous development of," if you're not into the whole brevity thing. This is an important point that my thesis supervisor, Paul D. Greene, drove home with me last year. Instead of thinking about music as "having originated with" or "being invented by" a particular culture, I learned to look at Nyahbinghi and reggae as genres that emerged from Jamaican religious and popular music, respectively. Like music, religious practices are always changing to reflect environmental pressures, social orders, and scientific discoveries. 2. In addition to the point Banning makes about the false dichotomy between sacred and secular, I'm fascinated by the idea that religious art and ritual appear to have been integral pieces of domestic life. I'm not too familiar with any theories related to my speculation here, but it seems to me that, if religiosity did indeed predate early human agriculture-based settlements, and if expressions of worship and mysticism first took hold in smaller domestic settings, then the eventual organization of religion transferred family dynamics into religious hierarchies. In other words, I wonder if priesthood was a natural outgrowth of a male-dominated family model in the fertile crescent, or if we can even hope to find archaeological evidence to suggest or discredit this possibility. Regardless, these 11,000-year-old structures show us that we have much yet to learn about our own species. And we can only hope that this means more jobs for anthropologists in the years to come.